Mabel Henderson - Heritage Funeral Homes Inc.
of Arthur passed away peacefully after a short illness surrounded by the love of her family at her home in Arthur on Saturday, January 12, 2019 in her 86th year. Mabel was born on January 18, 1933 to Orville and Agnes (Berry) Scarrow. 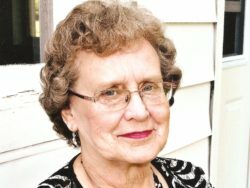 Beloved wife of the late Harold Henderson (2004). Cherished mother of Betty-Anne and David Samuel of Arthur, Linda and Peter O’Sullivan of Elora and Brian and Dawn Henderson of Fergus. Dear grandmother of Jennifer and Geoff Reed, Chris and Dana Samuel, Kevin and Melissa Samuel, Craig and Nadia Dow, Michelle and Dennis Epoch, Jessica and Pat Grayston, Scott and Teri O’Sullivan, the late Courtney Henderson (2003), Carley and Jasper Bago. Great grandmother of Kailen, Ella, Nora and Griffin, Gabriel, Siena, Charlotte, Colton, Delainey, Tysin, Kaysie, Jazmyn, Mason, Addie and Rylan. Sister of Norma and Hugh Revell, Doris White, Clifford and Marion Scarrow and Audrey and Jim Waddell. Sister-in-law of Jean Jackson, Alma Rennie, Ralph and Pat Henderson and Stewart and Phyllis Henderson. Fondly remembered by her many nieces, nephews and friends. Predeceased by her brothers-in-law Art White, Clarence Jackson, John Rennie and sister-in-law Georgina Henderson. The Family will receive friends at the Crawford Funeral Chapel, 243 George Street, Arthur on Tuesday, January 15, 2019 from 2 to 4 and 7 to 9 p.m. The funeral service will be held in the Funeral Chapel on Wednesday, January 16, 2019 at 11 a.m.
Spring interment in Greenfield Cemetery. As expressions of sympathy donations to the Arthur Historical Society or the Arthur United Church would be appreciated by the family.